Ratanakiri Zircon | Gemstones from A-Z at Rocks & Co.
Back Home Gemstone Information Ratanakiri Zircon | Gemstones from A-Z at Rocks & Co.
A gemstone since antiquity, Zircon has been found in some of the world's oldest archaeological sites. 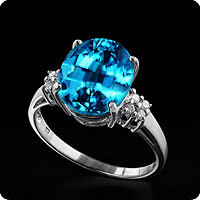 Ratanakiri Zircon is a commercial name for Blue Zircon from Ratanakiri Cambodia. 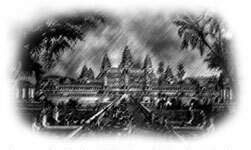 'Ratanakiri' means 'Gemstone Mountain' in Khmer. Despite Zircon coming in a variety of colours, its name has two possible etymologies; one is the Arabic 'zarkun' (red), another the Persian words 'zar' (gold) and 'gun' (colour). Composed of zirconium silicate, Zircon is not to be mistaken for the synthetically produced Zirconia. Zircon is rich in history and legend, appearing in several ancient texts, including the bible and the Hindu poem of the mythical Kapla Tree, which was bejewelled with leaves of Zircon. It is also believed that the angel Zircon was the guardian appointed to watch over Adam and Eve in the Garden of Eden. According to its mythology, Zircon represents purity and innocence. Like so many other gems whose changes in their colours or lustre are said to be indicative of their wearer's mood, health or fate, Zircon's loss of lustre apparently means danger is looming. 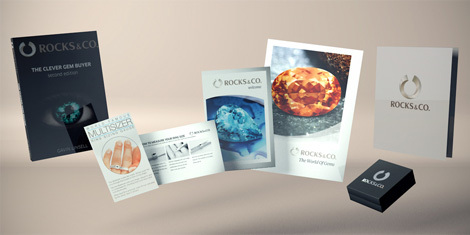 As a jewellery gemstone, Zircon has enjoyed several peaks in popularity. In 16th-century Europe, Italian jewellers featured Zircon and later it was also used in Victorian jewellery. Ratanakiri Zircon comes in unique blues, often due to greenish tints, and is typically eye-clean (no visible inclusions when the gem is examined 15 cm from the naked eye). Ratanakiri Zircon's transparency can decrease in the darker tones, gems with medium to light colours are generally preferred. Zircon is strongly doubly refractive, which means light splits into two rays as it passes through the gem. Zircon is known for its beautiful diamond-like sparkle, brilliance, fire and lustre. In order to maximise these optical properties, Ratanakiri Zircon needs to be carefully cut. Ratanakiri Zircon is primarily mined in Cambodia but also is found in Nigeria, Sri Lanka and Tanzania. As alluded to in this section's opening quote, Zircon is the natural gemstone that possesses a sparkle and looks most similar to Diamonds. 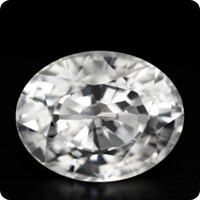 Its use as a Diamond substitute probably originates in Ceylon (Sri Lanka after 1972) in the late 18th century when white (colourless) Zircon was mined at Matara, which is located on the island's southern coast. It is from this locale we get the historic commercial names 'Matara Diamond' or 'Ceylon Diamond'. Zircon's high index of refraction give this gem its visual resemblance to Diamonds, resulting in a sharp brilliance, playful scintillation (sparkle), diamond-like lustre (variously described as adamantine or sub-adamantine, and high fire (also known as dispersion, this is the splitting of light into its component colours). With the advent of manmade synthetics, such as cubic zirconia and moissanite, Zircon is no longer the pre-eminent Diamond substitute.